Columns(tm) is a favorite among players for its simplicity. All you have to do is line up multicolored jewels and progress to higher and faster levels of play. It sounds easier than it is, but if you're a really experienced player and want to make the challenge as fresh as it used to be, COL Code 5 is a good handicap--it prevents you from pausing the game and having all the time in the world to plan your next move! Code 7 is even more of a challenge, since it prevents you from previewing the next jewel. If you're less of an expert and need a helping hand, try Code 6, which lets you practice at a level without having the game speed up. 1 Extra Magic Jewels - There is a way to trick the game into giving your a second magic jewel. To do this you must set up the screen in a certain way. Have one row of the normal jewels stacked up almost to the top of the playfield. There must be vertical space for only two of the three jewels in the next block to come on the screen. Watch the 'next block preview' box. When you see that the magic jewel block is next, get ready to quickly move it on top of your prepared stack. After the magic jewel eliminates the 'touching' color jewels, all of the remaining jewels will drop down as will the one magic jewel that was off the screen. This magic jewel will drop down and eliminate another group of colored jewels! 2 Extra 10,000 Point Bonus - To get a fast and easy 10,000 bonus points, have one vertical column empty all the way to teh bottom of the playfield. When you get the block with the three magic jewels, position it so that it falls down this column, all the way to the bottom. Since you don't get to use it to eliminate any colored jewels, the game gives you 10,000 points instead. 3 Instant Magic Jewel - Use this trick to make the Magic Jewel appear in Columns. Select ARCADE and the EASY mode. 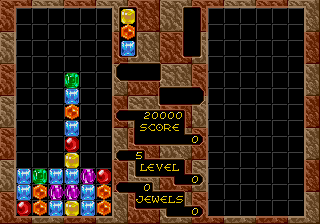 When you begin to loose, fill the far left or far right two columns as high as possible with jewels. When you've completed the column, the magic jewel will appear. PREMISE:          This has long been regarded as the nemesis of Tetris. vertical, or diagonal group of three of the same color. games, and the graphics are beginning to show their age. 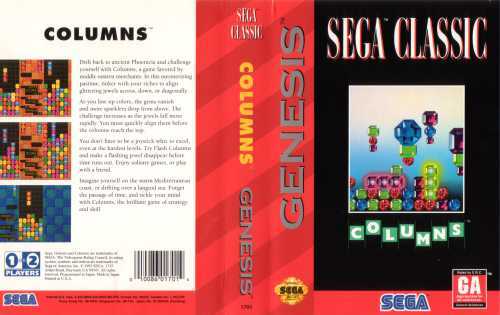 Columns is a great puzzle game. Some people would call it a Tetris clone, but they are infidels I tell you! Columns is unique, and has spawned it's own following of clones. It was the first puzzle game I ever played, and I've been hooked from day one. Columns III (A variation of the arcade Stack Columns) was a new toy to play with. With the added fun in vs mode this quickly became a favorite. The enemy characters get quite challenging at the highest difficulty level but it's not nearly as hard as that stupid Whinne the Pooh looking thing in Stack Columns. 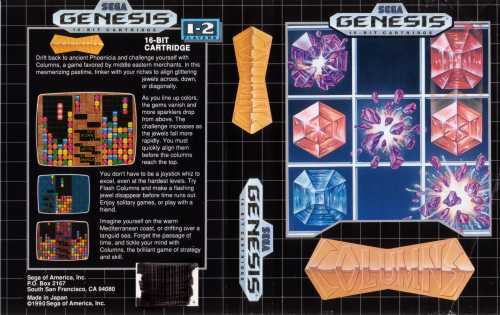 the first and best a equal to tetris if not better i think, this game provided hours of fun on the game gear and its still great on the mega drive it having 2 player mode etc. 9/10 legendary puzzle game you can always come back too. This was great for 4-way games. Never got to try it with five, but probably would have been cool. 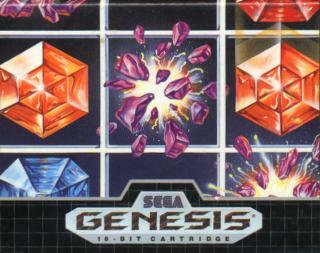 Like tetris for sega genesis! you MUST buy this! dont hesistate! get it! me and my friend used to play this game! it was highly addicting, you must, i repeat, you MUST get this great game! A++! This is a nice standalone game, but compared to Puyo Puyo (Dr. Robotnik's Mean Bean Machine), it just isn't as fun. It's a very fun puzzler, but Puyo really seems a lot more fresh in terms of addicting gameplay. This works, though. 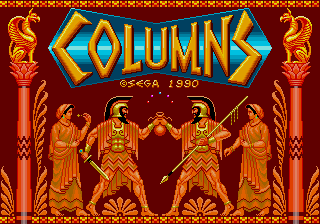 Columns 1 was brilliant, could play it for hours and hours and not get bored. Columns 3 was definatly harder but pretty good. Just one thing missing....what happened to columns 2 ? This is one of the most playable puzzlers on the MD. No doubt about it.